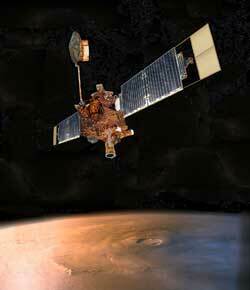 Mars Global Surveyor (MGS) is an orbiter, launched in November 1996 and designed, over the course of a full Martian year, to investigate the surface, atmosphere, and magnetic properties of Mars in unprecedented detail. It was the inaugural mission in a decade of planned intensive in-situ research of the Red Planet. MGS carries four main science instruments. The Mars Orbiter Camera provides daily wide-angle images of Mars similar to weather photos of Earth and narrow-angle images of objects as small as 1.5 meters across. The Mars Orbiter Laser Altimeter bounces a laser beam off the surface to measure accurately the height of mountains and the depth of valleys. The Thermal Emission Spectrometer scans emitted heat to study both the atmosphere and the mineral composition of the surface. Finally, the Magnetometer and Electron Reflection experiment provides data on the magnetic state of the crustal rocks, which in turn sheds light on the early magnetic history of the planet. One of the conclusions suggested by high-resolution images from MGS is that, although Mars had a watery past, it may never have rained. The water which carved the channels, first photographed by Mariner 9 in 1972, may have welled up from inside the planet in one-off floods (see Mars, water). Another surprise came in May 1999 with the announcement that Mars may once have had shifting tectonic plates, making it appear even more Earth-like in its youth and raising hopes still further that life may have emerged. MGS data revealed parallel stripes of crust in the ancient southern highlands, about 200 kilometers across and up to 2,000 kilometers long, that are magnetized in alternating directions – the product of magma "freezing" the ancient Martian magnetic polarization as it periodically switched back and forth. No magnetic field exists on Mars now, but the MGS observations suggest that strong active dynamo operated there for a least 0.5 billion years.